Well, I started by drawing out a plan of my room on graph paper. I thought this would be the best way since I didn’t want to be moving all the furniture around just to find out I have to move them back because it wasn’t going to work. So I measured the entire room, and measure each piece of furniture. 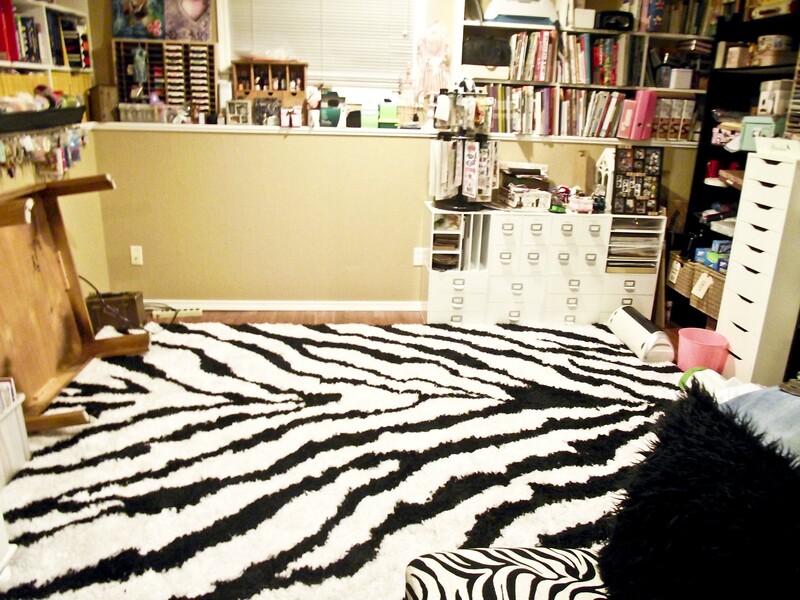 Then my husband called me and asked if I wanted a zebra shag rug for my craft room. I had to decide right away…..so I said sure! He said it was 8′ x 10′. So I also drew that out for me room plan. I wanted to make sure that rug was going to fit. Anyway…back to the rug….no matter what way I put the plan, the rug was going to be a problem. That’s until my Father-in-law said that it wasn’t exactly 8′ wide. It was actually 7′ 6″. Well, that made a hug difference! I love it! It is so soft! You can see from the picture that I moved a lot of the furniture out. I decided to get rid of the craft table, and the square table. I wanted to put my craft desk in the centre of the room, so that craft table was just not going to work. And if I have a desk in the middle, then the square table is not going to fit right either. 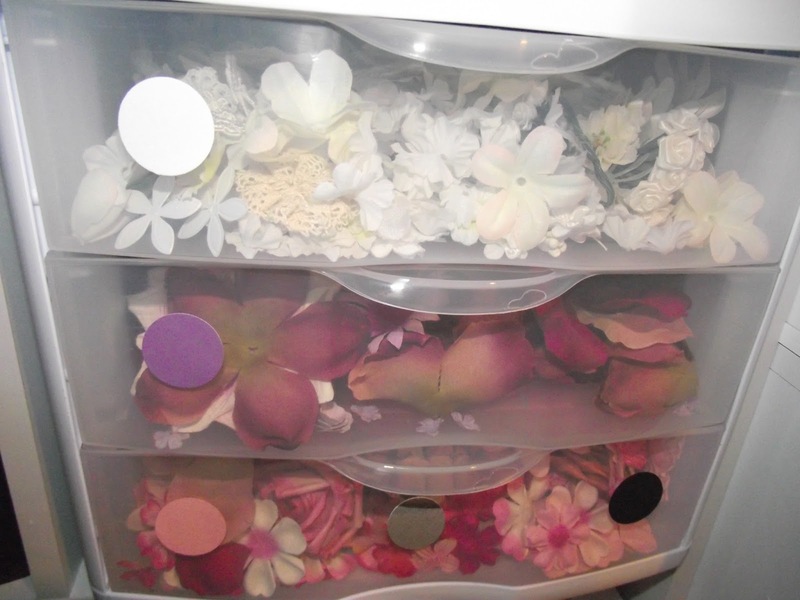 Oh, and what about my flower storage….. I got some narrow drawers from Walmart that fit inside my cubes. I sorted all my flowers, and took them out of their packaging. 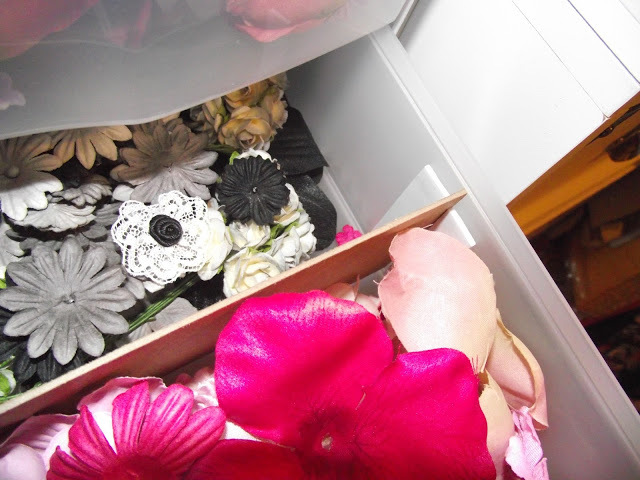 That was the only way I was going to fit all my flowers in these drawers! 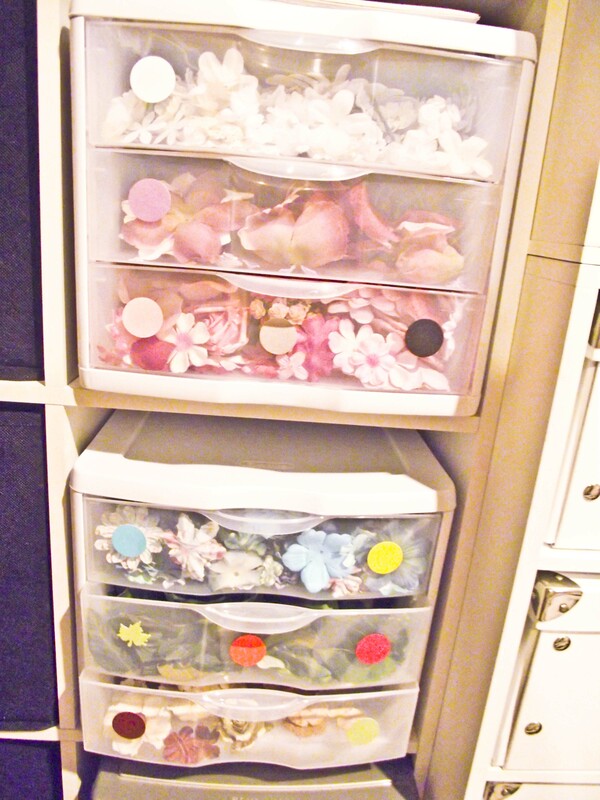 I then put colored dots (and a leaf) on the drawers so I know what colors are in each drawer. Some are split, and have other colors in them that you can’t see from the front. So these dots make it perfect! Then because I had to split some of these drawers up, I made partitions from chipboard and foam tape. Just a piece of foam tape on each side of the chipboard and….voila! Let me know how you sort your flowers….I would love to hear from you! I love your rug!! I wish I had a scrap room. 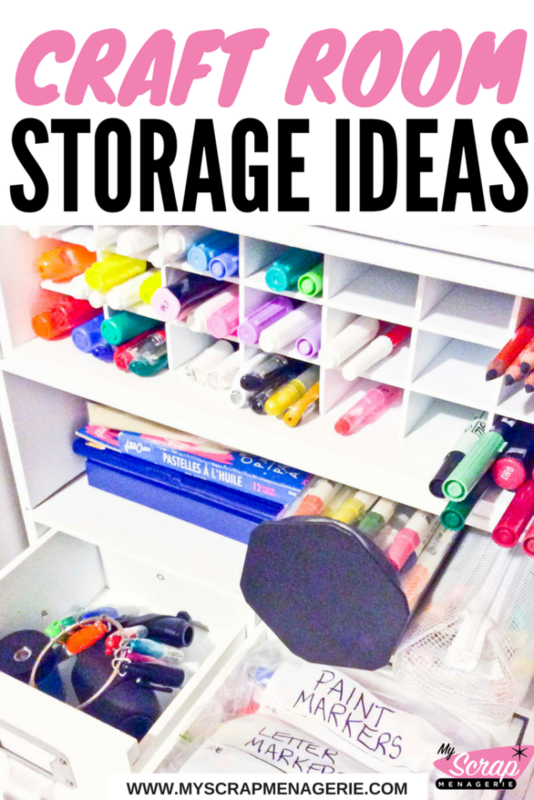 All of my supplies are in bins/containers in my room and have to drag it out every time I scrap and then I hate cleaning it up! I usually just think about what I might want to include on my LO/card and not bring everything out. I scrap here at my computer where I can multi-task- find ideas while I scrap or chat on Facebook! I can't wait to hear about your Scrapbook Carnival!! Have a great weekend!